Introducing the New Edition of So what? who cares? 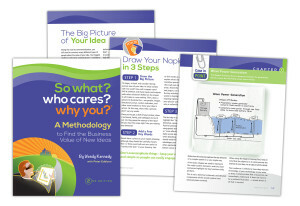 why you?® - wendykennedy.com inc.
Today is a special birthday! The release of the second edition of the So what? who cares? why you? methodology. It’s hard to believe it’s been ten years since the launch of the first edition. As a founder, it’s exciting to see a new idea take flight and be embraced by customers doing innovative things. This new edition is the product of the insight of passionate customers, innovators, entrepreneurs, certified coaches and others across more than 17 countries. It combines their collective advice and best practices for finding the business value inside early stage ideas. For over a decade, this community has explored, modeled and mapped the business value of new ideas spanning medical devices, alternative energies, robotics, aerospace, drugs, sensors and more. Take a moment to flip through the new book here. Join our webinar today at 3pm EDT to learn more about 2.0 of the So what? who cares? why you? methodology.